Place potatoes, broth and garlic in a large pot. Bring to a boil. Cover, reduce to a simmer, steam potatoes until fork tender, approx. 13-16 minutes. Drain and return potatoes and garlic to pan. To a small saucepan over medium-low heat add milk, butter and both cottage cheeses. Simmer until the butter is melted and the mixture is heated through. 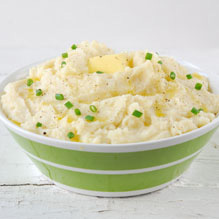 Pour half the warm milk mixture over the potatoes and mash the potatoes. Continue adding milk and mashing until desired consistency. Season with salt and pepper, garnish with chives just before serving. Recipe provided by the California Milk Advisory Board.